•allow for one handed reholstering. Had the Werkz not “passed” these requirements, I would not have continued the review. The Werkz holster took me on an emotional roller coaster if you will. A variation on their m2 iwb (customized for my gun and light) the holster, at first glance, appears to be very well crafted. All edges were buffed and perfectly smooth. It’s comes with a 1.5” injection molded clip that can be mounted at two different ride heights, straight draw or canted forward or backwards. It also has two tension screws for adjusting how much passive retention is on the gun/light combo. Retention is good when set to my preferred stiffness and a solid audible and tactile click is present when the gun is inserted, I knew I was going to love this holster. That is, until I put it on, while extremely comfortable I couldn’t conceal the gun. The grip printed horribly in my typical dress, shorts and a t-shirt. Standing a boring 5’10” and weighing in at around 150 lbs I realize that I’m asking a lot of a holster to conceal a g17 in my extra medium t-shirts. To give the holster a fair shake, I wore a slightly larger shirt a few days a week and carried around the house and at the range where I’m much less concerned with printing. After about 2 months, when taking the gun and holster off I noticed the two tension screws had completely backed out and where nowhere to be found. The gun still had plenty of retention while in the waistband but this was concerning to me. To be fair I didn’t apply loctite after setting the desired retention so I chalk this up to that. Since I used to make holsters in my shed, I have plenty of Chicago screws and such laying around so I replaced them and applied loctite this time (like I should have as soon as I got the holster). I decided to “modify” the holster at this point to make it more concealable so I superglued a pair of Dr. Scholls pads to the inside portion and glue a furniture slide pad to the front inline with the belt clip. This both tilted the grip into my stomach but rotated the grip around. 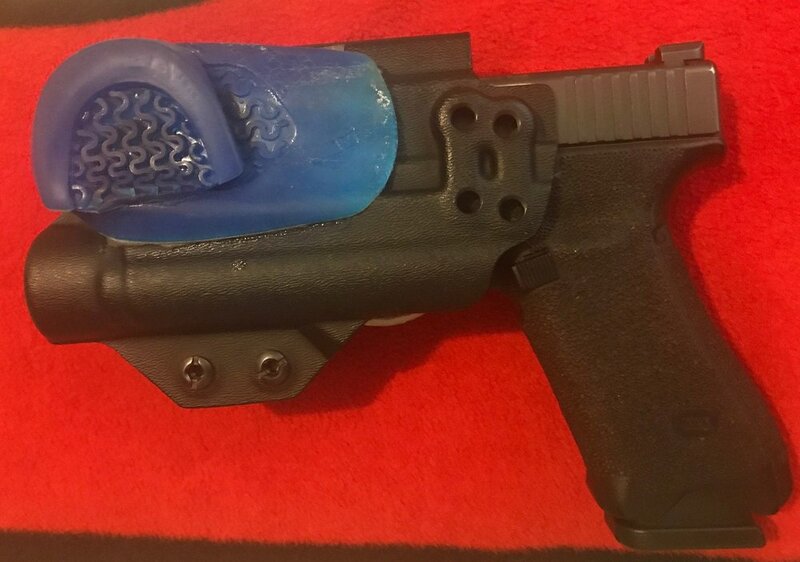 Werkz now offers a claw to accomplish the rotation of the grip and a quick google search of “the aiwb holster hack, Limatunes” will show you how to do the Dr. Scholls hack. I in no way removed material or heated the holster as to compromise the function of it. I simply added a wedge and a claw. The holster now works fine with my typical dress and I’m very pleased with it. I have over a thousand drawstrokes from it over the course of much dryfire and many range trips as well as about six months worth of carry. I’m carrying it everyday for now until the next new hotness comes around that I have to try. Black, Blue, coyote brown, dark gray, FDE, olive drab, carbon fiber black, carbon fiber blood red, carbon fiber coyote, carbon fiber fde. The only other reviews I found were on amazon and they tend to be hit or miss. MSRP - $42-80 depending model and options. Werkz.com - Ships next day on in stock, 2-5 days for quick ship customs and 10 business days on completely custom orders.